Maintenance immunosuppressive therapy of lupus nephritis (LN) is justified by the relapsing nature of the disease,1 especially as recurrent episodes of glomerulonephritis negatively impact long-term renal outcome. The goal of chronic immunosuppression in LN is to control the underlying immune processes without unacceptable drug toxicity. In this respect, it must be stressed that side effects of glucocorticoids (GCs) account for most of the damage accrual in patients with systemic lupus erythematosus (SLE),2 ,3 thereby fully justifying the use of other immunosuppressants as steroid-sparing agents. Mycophenolate mofetil (MMF) and azathioprine (AZA) are the most commonly prescribed drugs for maintenance therapy. They have been compared in two recent controlled randomised trials. Thus, in the Aspreva Lupus Management Study (ALMS), MMF was found superior to AZA to prevent treatment failures and renal flares at 3 years in patients with LN who had responded to 6-month induction therapy by intravenous cyclophosphamide (CY) or MMF.4 By contrast, after a mean follow-up of 4 years, MMF was not found superior to AZA in the MAINTAIN Nephritis Trial,5 in which the two drugs were compared after a short course of low-dose intravenous CY, that is, the Euro-Lupus regimen.6 The first objective of this analysis is to report on the 10-year follow-up of the trial, including the per protocol period (5 years) and the long-term outcome. The second objective is to identify early prognostic factors capable of predicting poor long-term renal outcome. Since chronic renal impairment and a fortiori end-stage renal disease (ESRD) are relatively rare and usually late events in the disease course, only long-term reports can address this pivotal question. 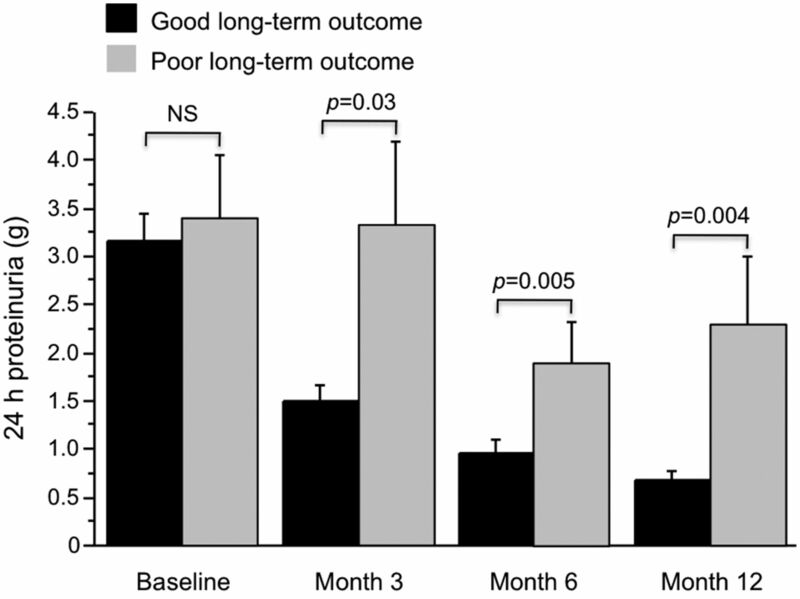 Here we show that: (1) long-term follow-up of the MAINTAIN cohort fails to unmask an advantage of MMF over AZA as maintenance therapy of LN; (2) an early decrease in proteinuria has a high positive predictive value for good long-term renal outcome; and (3) proteinuria decrease is sufficient to define early complete response (CR) as a surrogate for good long-term renal outcome. Between July 2002 and March 2006, 105 European patients fulfilling the classification criteria for SLE,7 aged ≥14 years, suffering from biopsy-proven proliferative WHO Class III, IV, Vc or Vd glomerulonephritis and displaying ≥500 mg/24 h proteinuria were randomised in the MAINTAIN Nephritis Trial, after having signed informed consent. This investigator-initiated study was conducted according to the Good Clinical Practice guidelines of the European Medicines Agency, did not receive external funding, and was registered at ClinicalTrials.gov (NCT00204022). All patients received three daily 750 mg intravenous methylprednisolone pulses (days 1–3), followed by oral GC therapy started on day 4 at an initial dose of 0.5 mg equivalent prednisolone/kg/day for 4 weeks. From week 4 onwards, GCs were tapered by 2.5 mg prednisolone/day every 2 weeks, down to 7.5 mg/day at week 24 and to 5 mg/day at week 52. From week 76 onwards, it was advised to taper the steroids further and to stop them if possible. All patients received six fortnightly intravenous CY pulses of 500 mg (fixed dose) within a 10-week period and were then started, from week 12 onwards, on AZA (target dose: 2 mg/kg/day) or MMF (target dose 2 g/day), according to randomisation performed at baseline and irrespectively of the magnitude of their renal response at 3 months. AZA or MMF was prescribed per protocol for 5 years, unless inefficacy or intolerance occurred. After this period, the decision to stop or to continue immunosuppressive treatment was left to the patient's and physician's decision. ACE inhibitors were mandatory in patients with nephrotic-range proteinuria (≥3 g/day) and strongly recommended in others. The primary end point of the trial was time to renal flare, analysed by Kaplan-Meier survival curves computed on the intent-to-treat population. A renal flare was defined as (1) the recurrence or the development of nephrotic syndrome or—only for patients with low-grade baseline 24-h proteinuria (≥0.5 and <1 g)—a threefold increase of 24 h proteinuria within a 3-month period (proteinuric flare); or (2) renal impairment (≥33% increase of serum creatinine within a 1-month period directly attributed to lupus and confirmed) (nephritic flare). After a mean period of 48 months, renal flares were observed in 25% (n=13) and 19% (n=10) of AZA-treated and MMF-treated patients, respectively.5 In January 2014, investigators were asked to provide long-term follow-up data on their patients including cause of death, new renal flares, renal function and proteinuria at last follow-up, current treatment, cumulative use of immunosuppressants and biologics and severe adverse events. Of note, these data were collected within the frame of standard of care, as all patients had terminated the 5-year protocol between 3 years and 6.5 years before current data reporting. As described elsewhere,5 MAINTAIN was designed as a superiority trial of MMF over AZA. The primary endpoint (time to renal flare) was used for power calculation. We anticipated a renal flare rate of 35% at 5 years in the AZA group. We defined the clinically meaningful difference as a 10% flare rate in the MMF group. To detect such a difference, 51 patients needed to be randomised in each arm to obtain a power of 0.80 with an α level of 0.05. Kaplan-Meier survival curves were statistically tested with the logrank test. HRs and their 95% CIs were calculated using the univariate Cox proportional-hazards model. Unpaired t tests, Mann-Whitney's tests, χ2 tests or Fisher's exact tests were used as appropriate. All analyses were by intent-to-treat, except the Kaplan-Meir curves. Of 105 patients randomised in the MAINTAIN Nephritis Trial, 5 died and 13 were lost to follow-up. Median (range) duration of follow-up was 110 (18–156) months. Of note, baseline characteristics of patients lost to follow-up did not differ from those who were not followed long-term (data not shown). Death was due to sepsis in four patients (at month 36, month 47, month 92 and month 119; two patients assigned to AZA and two to MMF) and to SLE in one case (at month 45; MMF patient). As illustrated by the Kaplan Meier survival curves shown in figure 1A, time to ESRD (one AZA and three MMF patients) did not differ between groups. Mean (SD) serum creatinine at last follow-up was 0.85 (0.4) mg/dL and 0.85 (0.7) mg/dL for AZA and MMF patients, respectively (p>0.99). Percentages of patients with estimated glomerular filtration rate (eGFR) <60 mL/min/1.73 m2 (19% and 11% in AZA and MMF groups, respectively; p=0.39 by Fischer's exact test), with serum creatinine >120% of baseline value (23% and 23%, respectively; p>0.99) or with serum creatinine >1 mg/dL (19% and 20%, respectively; p>0.99) at last follow-up did not statistically differ. Median daily proteinuria was 0.55 g at last follow-up in AZA patients and 0.70 g in MMF patients (p=0.58). Time to renal flare (all, proteinuric or nephritic) did not differ between groups (figure 1B–D). At last follow-up, 22 AZA patients had suffered from a renal flare (proteinuric in 18 and nephritic in 4), compared with 19 patients assigned to MMF (proteinuric in 12, nephritic in 6 and undetermined in 1). Table 1 compares the treatment of the two groups at last visit, as well as the need for additional immunosuppressants during follow-up. Of note, even 10 years after the diagnosis of LN, more than half of the patients were still on low-dose GC and/or another immunosuppressant. Interestingly, a third of the patients assigned to AZA or MMF were still taking the same drug at very long-term follow-up, at a mean (SD) daily dose of 95 (37) mg and 1.8 (0.7) g, respectively. AZA/MMF switch had occurred in 20% and 14% of AZA and MMF patients, respectively. The need for additional immunosuppressive therapy was similar in the two groups. These treatment changes were explained by renal and non-renal flares, as well as by pregnancy plans, which imposed switches from MMF to AZA. Severe adverse events (defined by the need for inpatient treatment) were equally common (42% and 36% of AZA and MMF patients during the 10 year follow-up, respectively). Of AZA and MMF patients 19% and 21%, respectively, had successful pregnancies during follow-up. Cancer was diagnosed in three patients, two from the AZA group (cervix) and one from the MMF arm (thyroid). Kaplan–Meier analysis of the probability of an absence of end-stage renal disease (ESRD) (A), all types of renal flare (B), proteinuric flare (C) and nephritic flare (D). All patients received Euro-Lupus intravenous cyclophosphamide, followed by azathioprine (AZA) or mycophenolate mofetil (MMF) as maintenance therapy. Survival curves were statistically tested with the logrank test. HR (95% CI). Numbers shown in abscissa are the number of patients at risk in each group at each time point. Analysis was by intention-to-treat. Next, we investigated whether long-term renal outcome could be predicted by baseline data, obtained at randomisation in the trial. A good long-term renal outcome group and a poor long-term renal outcome group were defined based on the patient's last creatinine, namely ≤120% of baseline value for good responders (n=83) and >120% for poor responders (n=21). As indicated in table 2, none of the baseline clinical, biological or pathological parameters tested statistically differed between these two groups. This remained true when other cut-offs of renal impairment (cf supra) were used to define good or poor renal outcome (data not shown). We then analysed whether the kinetics of proteinuria decrease within the 1st year of treatment differed between patients with good or poor late renal outcome, as previously defined. As shown in figure 2, proteinuria decreased much more promptly and dramatically in patients with a good long-term renal outcome. Of note, this remained true when different definitions of good/poor long-term outcome were applied (last eGFR ≥ or <60 mL/min/1.73 m2 of body surface area, last serum creatinine ≤ or >1 mg/dL or last serum creatinine < or ≥1.4 mg/dL) (see online supplementary file 1). The positive predictive value of an early proteinuria decrease ≤0.5 g/d for a good long-term outcome (in casu last serum creatinine value ≤120% of baseline) was excellent, that is, 89% at 3 months (24 patients with good late outcome among 27 who achieved such a level of proteinuria reduction), 90% at 6 months (38/42) and 92% (47/51) at 12 months. By contrast the negative predictive value of a proteinuria level >0.5 g/d was low (21%, 29% and 32% at 3 months, 6 months and 12 months, respectively), since many patients without a strictly defined proteinuria decrease also achieved good 10-year renal outcomes. Differential kinetics of 24 h proteinuria decrease in patients with a good and poor long-term renal outcome. Data are shown at baseline and after 3 months, 6 months and 12 months of treatment for patients with good long-term renal outcome (serum creatinine ≤120% of baseline value; n=83) or poor long-term renal outcome (serum creatinine >120% of baseline value; n=21). p Values indicated above the columns were calculated by Mann-Whitney tests. Finally, we investigated whether inclusion of renal function and urinalysis in the early response criteria improved the value of a defined proteinuria decrease as a long-term prognostic marker. As explained in table 3, we defined early CR, partial response (PR) and no response (NR) using three different sets of criteria, based on assessment of (1) proteinuria alone; (2) proteinuria and serum creatinine; and (3) proteinuria, serum creatinine and the presence of red blood cells in the urinalysis. CR, PR and NR were evaluated at 3 months, 6 months and 12 months. Table 4 shows the percentages of good long-term renal responders in patients achieving CR, PR and NR, at different time sets. The data demonstrate that proteinuria decrease alone drives the positive predictive value of the response at 12 months. Thus, the positive predictive value of a 12-month CR for a good 10-year outcome was 92%, 94% and 93%, using the three aforementioned criteria sets, respectively. At 3 months and 6 months, the addition of urinalysis slightly improved the positive predictive value of a CR but very few patients achieved such a strict definition. The MAINTAIN data clearly confirms that an early decrease in proteinuria levels within the 1st year of treatment is highly predictive for a good long-term renal outcome, as previously demonstrated in the Euro-Lupus Nephritis Trial.21 ,22 Of note, baseline data did not differ between good and poor long-term renal responders, very much in contrast to initial response to therapy. In this report, we show that patients whose proteinuria is ≤0.5 g/d at 12 months (half of the entire cohort) run a very low risk (8%) of any level of long-term renal impairment at 10 years. By contrast, the negative predictive value is low, which means that most patients without such a strictly defined early decrease in proteinuria will still have a good renal outcome at 10 years. The negative predictive value is not at all improved by the addition of serum creatinine data and results of urinalysis in the criteria set used to define early response. At the bedside, the clinician can therefore confidently reassure patients who achieve a durable early response in proteinuria but should not consider a switch to an alternative agent based only on non-achievement of this target. It is current practice to include the results of urinalysis in the definition of complete renal response, as proposed by American College of Rheumatology (ACR) recommendations for response criteria in LN clinical trials23 and by European League Against Rheumatism (EULAR) recommendations for monitoring patients with SLE in clinical practice and observational studies.24 These recommendations were applied in studies aimed at testing the efficacy of rituximab (LUNAR; Lupus Nephritis Assessment with Rituximab study)25 or abatacept in LN.26 Yet, the persistence of microhaematuria within the 1st year of LN treatment is no longer considered by nephrologists as a predictive biomarker of poor long-term renal outcome.27 Therefore, some newer LN trials, such as ACCESS (Abatacept and Cyclophosphamide Combination Efficacy and Safety Study), do not include urinalysis in the definition of the primary outcome (clinicaltrials.gov identifier NCT00774852). The MAINTAIN data presented here are consistent with this decision, as they indicate that proteinuria alone drives the positive predictive value of the response at 12 months. Persistent haematuria at 12 months should therefore not influence treatment decisions at the bedside. To examine this issue further, investigators from the Lupus Nephritis Trials Network are currently analysing the Euro-Lupus Nephritis Trial data again, for which long-term follow-up is also available,22 with the idea to test short-term predictors of long-term outcome. The MAINTAIN Nephritis Trial suffers from limitations, which have already been discussed at length in the manuscript dealing with the 5-year per protocol data,5 in particular the relatively small number of patients included in the trial. Needless to say, as further treatment was left to patient's choice and physician's judgement, numerous treatment changes occurred between year 5 and year 10, for many different reasons, including non-renal issues, thereby complicating interpretation of long-term data. 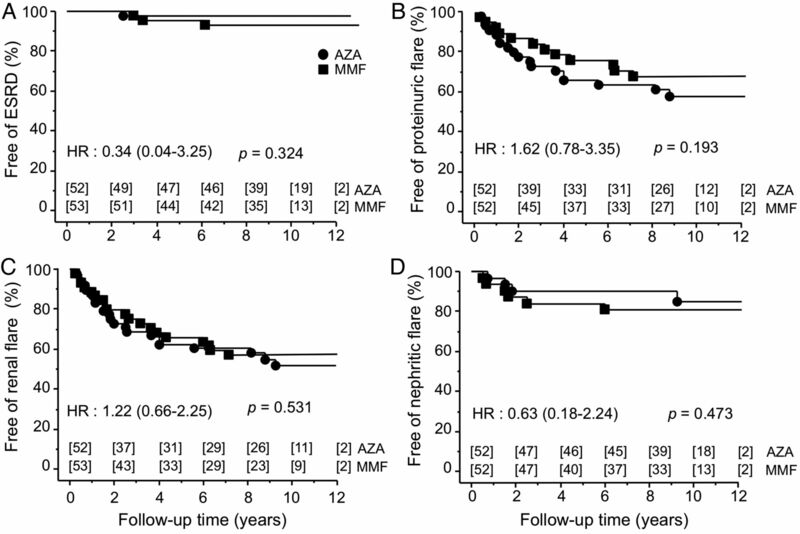 Yet, hard outcomes, such as death, ESRD and last creatinine, which can be addressed only by long-term studies, did not differ whatsoever between the AZA and MMF groups at long-term follow-up. Despite these limitations, the data presented here thereby confirm the relevance of EULAR/ERA-EDTA (European Renal Association-European Dialysis and Transplant Association)28 and ACR recommendations29 regarding maintenance therapy of LN, namely that AZA and MMF can be prescribed. Moreover, our data provide compelling evidence that an early proteinuria decrease is an excellent predictor of good long-term outcome, again an observation that can be obtained only by investigator-initiated long-term trials. The authors thank the patients who participated in the study.
. Biologic therapy in lupus nephritis. Nephron Clin Pract 2014 [epub ahead of print]. Collaborators Other collaborators of the MAINTAIN Nephritis Trial Group were: Daniel Abramowicz, Nephrology Department, Hôpital Erasme, Université Libre de Bruxelles, Brussels, Belgium; Fabiola Atzeni, Unita Operativa di Reumatologia, Ospedale Luigi Sacco, Milan, Italy; Maria Giovanna Danieli, Istituto di Clinica Medica Generale, Universia Degli Study di Ancona, Torrette di Ancona, Italy; Luc De Clercq, Rheumatology Department, Sint-Augustinus Ziekenhuis, Wilrijk, Belgium; Enrique de Ramon Garrido, General Internal Medicine, Hospital Regional Universitario Carlos Haya, Malaga, Spain; Filip de Keyser, Rheumatology Department, UZ Gent, University of Ghent, Ghent, Belgium; Michel Delahousse, Service de Nephrologie, Hôpital Foch, Paris, France; Gerard Espinosa, Department of Autoimmune Diseases, Hospital Clinic, Barcelona, Catalonia, Spain; Marc Golstein, Service de Rheumatologie, Cliniques Saint-Jean, Brussels, Belgium; Marco Hirsch, Luxembourg, Grand Duchy of Luxembourg; Alexandre Karras, Service de Néphrologie, Hôpital Européen Georges Pompidou, Paris, France; Philippe Lang, Nephrology Department, Hôpital Henri Mondor, Créteil, France; Martine Marchal, Service de Néphrologie, Hôpital de Tivoli, La Louvière, Belgium; Antonio Marinho, Clinical Immunology Unit, Hospital Santo Antonio, ICBAS, Porto, Portugal; Regina Max, Department of Internal Medicine V, University of Heidelberg, Heidelberg, Germany; Patrick Peeters, Nephrology Department, UZ Gent, University of Ghent, Ghent, Belgium; Peter Petera, Zentrum für Diagnostik und Therapie rheumatischer Erkrankungen, Krankenhaus Lainz, Wien, Austria; Radmila Petrovic, Institute of Rheumatology, University of Belgrade, Belgrade, Serbia; Thomas Quémeneur, Centre Hospitalier Régional Universitaire de Lille, Lille, France; Frank Raeman, Rheumatology Department, Jan Palfijn Hospital, Merksem, Belgium; Piercarlo Sarzi-Puttini, Unita Operativa di Reumatologia, Ospedale Luigi Sacco, Milan, Italy; Lucia Valiente de Santis, General Internal Medicine, Hospital Regional Universitario Carlos Haya, Malaga, Spain; Luc Verresen, Nephrology Department, Ziekenhuis Oost-Limburg, Genk, Belgium; Laurence Weiss, Département d'Immunologie, Hôpital Européen Georges Pompidou, Paris, France; René Westhovens, Rheumatology Department, UZ Gasthuisberg, Katholieke Universiteit Leuven, Leuven, Belgium. Contributors Study design: DD, GD, RC and FAH. Patient recruitment and follow-up: FT, DD, SS, PR, CV, CF, MdMAG, I-MG, MT, DB, IR, VlG, LG, RC and FAH. Data acquisition, data collection and organisation, manuscript writing, data interpretation, and manuscript review: FT, DD, SS, PR, CV, CF, MdMAG, IMG, MT, DB, IR, VlG, GD, LG, RC and FAH. Ethics approval Ethical approval was obtained in each participating hospital. The central IRB was at the Université catholique de Louvain. Data sharing statement All available data has been shared.